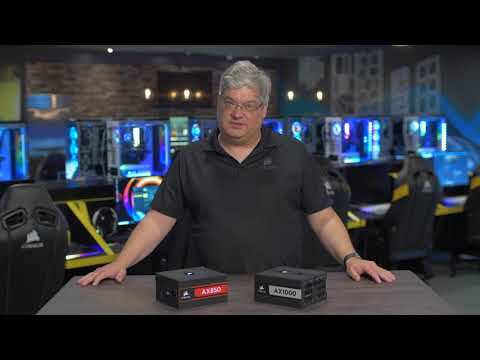 80 PLUS TITANIUM CERTIFIED PSU AX Series fully modular power supplies deliver 80 PLUS Titanium efficient power and ultra-low-noise operation to complete your most ambitious builds. The highest quality internal components and all-Japanese 105°C rated capacitors provide the tightest voltage regulation and lowest ripple noise, delivering only the highest quality power to your PC. A 135mm fluid-dynamic bearing fan with Zero RPM Mode only turns on when needed, ensuring virtually silent operation at low and medium loads. Fully modular flattened cables make building or upgrading your PC easy as you only need to install the cables your systems requires. With the strength of 80 PLUS Titanium efficiency, and the subtlety of near-silent operation, the CORSAIR AX Series is ready to power the world’s best PCs for years to come. KEEP YOUR BUILD LOOKING CLEAN The easy to install, fully modular setup on the Corsair AX850 allows you to combine the low-profile cables provided for a great-looking build. Only connect the cables your system needs, making clean and tidy builds easier. 135mm Cooling Fan 135mm Cooling fan with true FDB bearing delivers low-noise operation even at demanding loads whilst having a longer life. The cooling fan also switches off entirely for near-silent operation. Superior voltage regulation and minimal ripple noise ensures the highest quality power for your PC. match up your components Customize your PSU to match the rest your system with three included magnetic side labels in red, blue or white. 80 PLUS TITANIUM CertifiedTITANIUM certification ensures the highest level of efficiency and performance.